Your names or dirty characters are recorded in my reports, in "My Story In Detail " , in fbi's own records and in my thousands of posts online. I even photograph (and post)some fbi operative/assassins as they assault me in malls, Libraries, movies, etc. The eternal shame on each of you resonates throughout history for all to see as examples of the degeneration of mankind. You, by your inhumane deeds that I chronicle, also assault people of good will everywhere by revealing your mindless and Godless nature as reflected in your criminal behavior in service to fbi's own murderers. Finally the human monsters of fbi with your assistance have doomed the USA. ISP	United States Postal Service. I have documented several crimes committed by USPI Knipfing et al. in the office of USPI, including lies to congress, coverup of mail crimes by fbi against me, fabrication of crimes & threats by Knipfing and Rodriguez against me and my wife in my home, in my face and in retaliation for my reports of USPI/fbi crimes. The thugs of USPI seek to silence anyone who makes a prima facie case of criminal corruption of fbi/USPI. See my affidavits of 2007 & 2014 and my reports on Knipfing's threats which continue even now, years after he opens his fraudulent case on me. Meanwhile, fbi and Knipfing retaliate each time that I expose their heinous character in my posts. Thanks and may Providence give aid, comfort and blessings to all who suffer under the filthy actions and thoughts of fbi and USPI and others who have overthrown the USA government, subverted the cowardly Congress and courts/judges, and threaten all of us by constant efforts at intimidation. See my recent work on exposing the fbi and the cia as torturers and human monsters. Pouring toxic fumes that cause serious lung problems; attacking me with Directed Energy Weaponry (DEW) causing multiple symptoms including extreme sleep deprivation. For more symptoms, see "My Story In Detail" at part 19 of my main website at SOSBEEvsfbi. As I have tried to stop the thugs and assassins of the fbi to stop their macabre vendetta against me, I have discovered that the USA uses similar criminal methods against many others. Congress and all courts are afraid of the fbi and all federal Magistrate Judges actually approve of the crimes that the fbi commits against me. These high officials are guilty by proxy of the felonious offenses that I document. The EPA and all other federal agencies also ignore my reports and requests for assistance. This report is predicated on the continuing efforts by fbi to kill me. *I previously recorded efforts by the fbi to silence me. Several years ago the Texas Scottish Rite Hospital For Children notified me subliminally that the fbi entered into their offices and accessed the medical records of my treatment there as a small child. The fbi discovered that I was born with a congenital pulmonary weakness that results in a lifetime of life threatening medical reaction to cigarette fumes of any kind. Subsequently, the fbi began pumping fumes into my residence everywhere I live. I suffered an acute bronchitis attack following one such fbi attack and the doctor treated me with antibiotics and advised me of the risk of cancer and emphysema, if I continue to breathe the smoke. I fled the USA to live temporarily in Mexico. I have been forced to move out of residences about 15 times in as many years and today I face yet another similar threat on my life. B ) lessens the intensity of the DEW assaults the following morning, causing me to sleep unaware that I am breathing the toxic fumes, until I awaken and detect the odor of cigarettes and the tell tale symptoms (i.e., difficulty breathing and discomfort in chest). The fbi knows that this kind of assault eventually kills. When I asked the neighbor about the fumes, he stated that he does not smoke and knows nothing about how the smoke enters my unit. He smiles and half laughs when I advise him that I must move due to medical necessity caused by the fumes. Separately, the fbi places another thug directly across the driveway from me and that thug harasses me regularly via vandalism and strange noises directed at me. The fbi no doubt pays his rent and he therefore does anything the fbi demands. Now I and my wife are faced with the same challenge as before: We must move as soon as possible as a matter of life and death. "Now, it is important to understand the concept of "plausible deniability". Quite simply, this means that the conspirators and liars running the COINTELPRO-style operations set up a little insurance policy to protect themselves; a contingency plan in case their criminal operations are exposed. They can then DENY any involvement or wrongdoing which might implicate them in the conspiracy. How do they do this? One way is to use lowly minions to do their dirty work: those who have no official status within the government, from whom they can easily distance themselves if their plans go awry." Geral W. Sosbee: Update to fbi continues the dark art of gaslighting. All harassment against me in the Madrid house was performed by my Hispanic neighbors who readily accept the calumny planted in their minds; this is ironic because the fbi assassins continue their vendetta because 45 years ago I reported fraud by the fbi in the case of an *Hispanic woman whom I was ordered to arrest in Tampa, Florida. So, the neighbors are foolish and criminal in their assaults on me as directed by the fbi traitors who manipulate the people at will. In a different residence I was faced with an unending string of harassing events by another Hispanic woman who just could not contain her mindless animosity. The fbi directed her to try to provoke a response to her insane assaults. In the fbi's efforts to silence me the special agents in their covert, illegal counterintelligence operations send street thugs to assault me and my wife on a regular basis for about the past twenty five years, continuing today. In Los Angeles about 16 years ago a fbi criminal knocked me off my feet in his provocative assault in the LA Public library. These two assaults by thugs acting as operatives are designed to provoke an unacceptable response, and the fbi's high level operative, a federal magistrate judge in southern Texas (a sociopath in service to fbi hoodlums) stands ready to issue criminal or civil arrest warrants as the fbi may fraudulently try to justify. In parts 19 (a,b,c) of "My Story In Detail" I have proven by an open court plea of "no contest" entered by one Alonzo Yanez that he committed a provocative assault and minor battery on my person. Today, the fbi demonstrates via increased vandalism on my property, DEW attacks, and assaults by street thugs, that the fbi, here in southern Texas, is under orders from Bureau headquarters (i.e.,the 'burro') to at long last silence me, permanently. I am therefore cautious everywhere I go to be vigilant and calm during the many crimes committed against me by the fbi. The Cameron County DA and investigator George Delaunay intentionally violate the Texas Open Records Act (ORA) by withholding the contents of the email from Delaunay to the fbi. Please note that I and my wife were victims of crimes which the Brownsville, Texas Police covered up and subsequently the DA and his investigator (Delaunay) also refused to allow us to make a report with the DA. The enclosed document is an admission from Delaunay that he in fact has the item that ORA includes as public information and as pertaining to public business; Delaunay is prohibited by law from destroying, removing or altering the information. Texas Gov. Code 552.351. The material is used in the transaction of public business Tex. Loc. Gov. Code 203.041, 203.025. Also Gov’t Code section 551.001 (2) clearly defines the data wrongly withheld by Delaunay because the data is within the jurisdiction of the government body and is public business. Emails wrongly withheld by Delaunay are covered under the ORA by OR 2005-06753 relating to official business OR 2003-0951. Any effort by Delaunay and the DA to continue to withhold is a violation of Tex. Gov. Code 552.302 because they both waived any such claim as per the enclosed admission from Delaunay that he communicated with the fbi about “Sosbee”. Please order the DA and Delaunay to comply with ORA and provide me with the contents of the Delaunay’s email to fbi and any subsequent emails to or from the fbi regarding me (Sosbee). Enc. : One copy each of the following documents: 1) Memo from Janie Carrizales, dated 1-15-16; 2) Memo from Janie Carrizales, dated 1-5-16; 3) My letter to AG, dated 3-3-16. CONTINUED VIOLATION OF OPEN RECORDS ACT (ORA) BY DA, INVESTIGATOR DELAUNAY, BROWNSVILLE, TEXAS PD (BPD), ETC. For background information already in the possession of AG, please see the above referenced letter to AG from me and the Carrizales memo dated 1-5-16 which are enclosed herewith. For evidence of the DeLaunay refusal to release data in his possession in violation of the ORA please see the memo from Carrizales, dated 1-15-16. I request that the AG order the DA and DeLaunay to release the contents of DeLunay’s email to the fbi at ‘ryan.flint@ic.fbi.gov’ as shown in the Carrizales enclosed herewith and dated 1-15-16. In my previous letter to the AG shown above I explained why the Delaunay email to the fbi is subject to disclosure under the ORA and that DeLaunay intentionally violates the law by not surrendering it. Please note that this matter was precipitated when Detective Adrian Posada et. al., of the BPD refused to take a report of a crime, threatened me for reporting the crime and insulted me in his office. Subsequently, Posada wrote a false police report in order to cover up his original violation of law, and now the DA also covers up the violations of Posada. The thugs who have damaged my vehicles for over 25 years (totaling about $25,000 in out of pocket losses) are operatives for the fbi. So, when DeLaunay withholds the email (referenced above) from me he in effect is an accessory to the offenses by the BPD, the crimes by the fbi operatives and is in violation of the ORA. I ask the AG to carefully consider this request and issue an order to the DA and to DeLaunay to comply. Below is a description of the apparatus of terror & intimidation used by the USA's Central police authority which is the fbi. 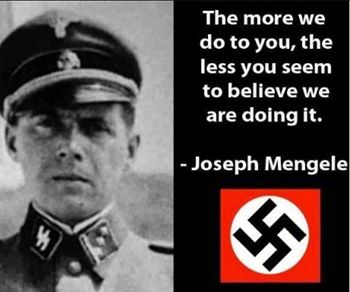 Today, the fbi enjoys the same dictatorial authority that was Adolf Hitler's in his time and place. A few observations in the next paragraph are borrowed from Jarred Boyles who addressed the high crimes committed by Adolf Hitler. Boyles reported on some of the confessions of Nazi war criminals who operated with the implied consent of the people of Germany. "What is it about a dictator that makes men set aside their own morality and so heedlessly slaughter other human beings? Do their cries of pain fall on deaf ears? Fear is a perfect motivating factor, but how can fear paralyze millions of people so thoroughly? " Today in the USA all Americans are afforded the opportunity to read my reports of fbi atrocities against me and others, but no one tries to stop the crimes because the fbi as dictator instills such extreme fear as to practically paralyze the members of government and most in the general population. In other words the people of the USA impliedly consent and often approve of the fbi hideous offenses that I chronicle. Extensive documentation of my allegations against the fbi are on line, as are items of proof that Congress and the Courts pretend that the fbi is innocent and is collectively Mr. Wonderful protecting the USA from criminals; nothing could be further from the truth. poisoned him extensively and watched him collapse and seek emergency hospital care; made sure his doctor was incompetent and that he would need to flee the hospital for his life; frequently entered his home and destroyed some of his clothing; tampered with certain items so he would know that we watch him 24/7/365 in order to devise ways to drive him crazy; destroyed his cars when warranties expired, and took over by remote control the electronics of his car and his home for harassment purposes; attacked him relentlessly with directed energy weaponry (DEW) including microwave (causing blisters and cancers) and with extremely low frequency (ELF) sound waves causing disturbing sleep deprivation permanently; watched him in his car and home in order to plot new psychological assaults; sent street thugs to provoke him in order to try to arrest him on any charge for over decades; notified all police and all of his contacts that he is under investigation and is a dangerous mental case; repeatedly tortured him while he was in the hospital for treatments of injuries that we caused, or that he suffered in the army. When he attempted to report our attacks, we used his writings as evidence that he is dangerous, angry and a possible mass murderer (and that due to his combat service to USA he is by definition a murderer); orchestrated a crime scene where we planted his name as a prime suspect and subsequently directed high level police from state and federal agencies (not fbi) to open an official, full field criminal case on him. All of this is even now conducted by our counterintelligence group and is authorized by federal judges/magistrates based on ex parte sworn fraudulent statements from our operatives. Geral Sosbee somehow survived decades of these little atrocities even into his seventies and we plan to continue the macabre program against him until he dies. Extreme psychological assaults are increased against me as are other covert and invisible physical attacks such as the ever present bombardment in my ears by extremely low frequency sound waves (ELF, causing rapid hearing loss). Another related high tech painful attack is difficult to explain for two reasons: 1) The method is unheard of, incredible and impossible to prove 2) Any effort to present evidence of such a torturous technique may be misinterpreted as evidence of paranoia. The fbi as I have demonstrated exploits the willingness of people to accept the label, especially when a M.D. records same in the records. During my Army service my ears suffered injuries which are aggravated by ELF and which today require hearing aids. The VA provided me with Widex A/S, Nymoellevej 6, DK-3540 Lynge, Denmark www.widexdotcom hearing aids which are programmed for each ear by a specialist. The remotely operated device has an operating range of three feet and all functions and all settings are thus remotely controlled. The frequency of the device is easily available to the fbi via satellite as a result of the tracking device implanted in me. Occasionally I notice that the settings on the hearing aids are remotely and dramatically changed, not by me, to loud and unbearable levels. So, I deduce that my remote control device on the aids is compromised. The fbi is notorious for taking over other remote control devices for harassment purposes (i.e. : TV, car). A former fbi agent (hereinafter referred to as 'NS') regularly visits my website on the page where I document the fbi's synthetic production by chemical combination of a kidney stone in my body as set forth in part 16 of "My Story In Detail". The reason for the visit by NS is not clear, but NS has previously sent ugly messages to me as though NS monitors my posts online and at the same time shows an obsessive interest in fbi attempts on my life. I can only speculate, as may the reader, as to the possible subliminal message which NS seeks to impart. Finally, as I have shown in other reports, the fbi's psychological attacks are of an heinous nature and are so unbelievable that I do not want to believe that this government would use such against anyone. This report is submitted for the record. The fbi assassins, emboldened by refusal of police to investigate crimes against my person and Detective Posada's implied threats to arrest me for my efforts to file a police report, resume a string of felonious, provocative assaults. Even Commander Paschal's statement that for my problem with the fbi, "talk with the fbi". The false report by Dr. Holder also provides cover for the assassins of fbi as they can 1)claim plausible deniability or 2) attribute paranoia to this victim of their covert crime spree. DEW assaults also continue. United States Magistrate Judge Ronald G. Morgan. I believe that a federal judge authorizes all fbi crimes against me. United States Magistrate Judge Ronald G Morgan. (After this report is posted, the fbi assassins turn up to extreme level the DEW assaults). Torture and the fear of torture controls the world. "... some forms of torture are designed to inflict psychological pain or leave as little physical injury or evidence as possible while achieving the same psychological devastation. " Re:The Posada Adventure & the corruption of our society by fbi hoodlums. The police leaders, DA, AG, Texas State Bar's CDC, legislators(federal & state, and others in power) all show fear of or subservience to the assassins working for the fbi. NO ONE HAS THE COURSE TO LIFT A LITTLE FINGER AGAINST fbi THUGS. I have exhausted all apparent avenues to stop or to slow down criminal assaults by fbi operatives, but with no success; even today the fbi sends their little mouse - type thug at me in the public library as I seek to use the computer. E.G. : Jon Freier with T MOBILE responds favorably to my *email wherein I show the repeated destruction of my tablet by fbi hackers. Thank you Mr. Freier. Is there anyway I could purchase a T-Mobile tab with a complete lifetime warranty, so that I am protected from future problems. Please note that the fbi may be less likely to destroy or incapacitate the tab if I have a full warranty from T-Mobile. Few fbi/cia thugs serve the *USA in combat, yet the assassins in these two agencies run counterintelligence plots against many of us who actually defended this corrupt and murderous regime on the battlefield. I am one such Target who aggressively resists such low punks in fbi/cia. My name is Geral Sosbee. @gsosbee "You are not as smart as you look, and you don't look that smart to begin with". Fbi and police often team up. I first met detective Adrian Posada, Brownsville Texas Police Department (BPD), when he came to my residence to investigate vandalism of my residence. On a different occasion I tried to file a report with Posada on vandalism of my car. To my great amazement Posada refused my report. Detective Posada (D.P.) in apparent retaliation against me recently refused to take my and my wife’s report of vandalism, questioned my sanity and impugned my veracity, covered up the crime that I reported, made no effort to investigate the crimes (stalking and vandalism of our car), apparently began a bizarre investigation of me, intentionally and repeatedly violated the Texas Open Records laws by not revealing the data in his possession, and generally engaged in unprofessional police activities designed at least to intimidate me, or to fabricate a crime which he might then attribute to me. On or about December 15-16, 2015, he apparently appeared at the repair shop that fixed the vandalized headlight and he investigated my activities there. Both he and the BPD presently maintain that no report exists regarding the vandalism on my car on November 20, 2015. On Christmas Eve Commander Henry Etheridge(BPD), called me and invited me to file the report that Posada refused to accept. I advised Etheridge that I filed the report with the Sheriff when I realized that Posada had not made an incident report and that Posada insulted me as mentioned above. Then, on Christmas day (today) the top cammander of the BPD (James Paschal) calls me and invites me to come into police headquarters, or permit him to come to my home, to discuss this matter. I declined and suggested to him that he might first consider asking Posada about his outrageous and apparent unlawful actions against me. Meanwhile, I notify the Texas AG and the local DA of the sordid affair. Now, I must ask why did Posada turn hostile against me, who influenced Posada to impliedly threaten me for (in his deceitful words) 'filing a false police report', and why did Posada suggest to me to 'take the medication' for paranoia. I asked BPD internal affairs officer Rolando Vasquez to inquire, but to no avail. I believe that someone illegally and fraudulently influenced Posada to improperly respond to my request for a police report on the vandalism incident of November 20, 2015, and that Posada assumed the role of criminal investigator against me on behalf of the same person who thereby prejudiced him against me. I suspect that the fbi is involved in the matter in a manner similar to fbi efforts to provoke me, or to fraudulently set me up for imprisonment as I have shown in the following links,two of which involve fbi and UT Police joint crimes against me on campus. Note that both Internal Affairs officer Rolando Vasquez, and a female records clerk are witness to the tricks by Posada concerning his false statements (as shown below & as represented in the above Barbara Hartwell link). EG:As we were leaving the building, I asked X for a case number so I could obtain a copy of the report; he answered, ‘just a moment’. He then went into the dispatch room to obtain a case number; when he returned, he gave me his card with a number on it. When I presented the case number to the records office a few days later, the clerk advised me that the number that I provided to her was X’s phone number, and that no record exists regarding my report of vandalism of my car on November 20, 2015. 1) Probably the fbi and DPS/USPI fed prejudicial or poison data to Posada. See above affidavit. "Poisoning the well (or attempting to poison the well) is a rhetorical device where adverse information about a target is preemptively presented to an audience, with the intention of discrediting or ridiculing everything that the target person is about to say. Poisoning the well can be a special case of argumentum ad hominem, and the term was first used with this sense by John Henry Newman in his work Apologia Pro Vita Sua (1864). The origin of the term lies in well poisoning, an ancient wartime practice of pouring poison into sources of fresh water before an invading army, to diminish the attacking army's strength." On December 31, 2015, Detective Posada provides me with a police report Number 1512-2240 relating to the crime (which he previously refused to investigate) by the fbi against me as reported in the above two links. The Posada police report (attached hereto as PDF) misrepresents the facts and pretends to show an effort to investigate the crime, but he never gave me an opportunity to provide details. He apparently used for his report the Cameron County Sheriff's report that I filed with them after he and the BPD stated that no record exists on the crime. 1) cover up his unprofessional actions and 2) discount my report that the fbi thugs committed the crime. In fact the repair mechanic advised that someone disconnected the light from under the hood; Posada says that the car's vibration caused the disconnection of the light. Posada also says that there were "no signs of vandalism"; this statement is misleading as the fbi routinely leaves no evidence of vandalism when they destroy or damage my cars over the past 25 years. So, Detective Posada provides me with a report that he previously refused to accept, refused to investigate, and he accused me indirectly of 'insanity' and 'filing a false police report', and presently he intentionally misleads the reader regarding the crime that I reported to the Sheriff. This post is submitted for the record. See how the fbi seeks to control human behavior via torture as shown in the following report. macabre culture and unlawful practice of the fbi. same day, the fbi sends a thug to assault me in the Brownsville, Texas mall. typo in following report: my name from birth is Geral. The fbi harassed me by extreme DEW assaults the night prior to the admission to the bar hearing in the United States District Court, Southern District of Texas; then, this afternoon after I left the courthouse, the fbi took over my car's electronic systems and began harassing me again by manipulation of the remotely controlled features. These events show how the fbi views federal courts; and this little demonstration by the fbi also shows that the fbi's *secret courts operate independently from the rest of the judiciary which has no power over the crimes committed by these fbi controlled secret courts functioning in concert and in conspiracy with the assassins & torturers of the fbi. Weep for this country. I also met two of the federal Magistrate Judges today and all such officials are appointed to their high posts only if fbi background checks permit. See my writ that shows how all federal courts trash my pleas for an injunction to stop the fbi's torture and attempted murder campaign against me. As an apparent result of the * success of my constant posts on line and other activities, the fbi now increases DEW and related assaults so as to basically render me void of energy, burdened with severe headaches, etc. I also suspect that the assassins in fbi use other high technology against me. fbi plants misleading data on Internet to mislead. In the fbi's desperation to detract from my work online the fbi invades an administrative ranking service and plants fraudulent references & images intentionally meant to publicly mislabel my work and associations. See fraudulent images planted by fbi on the *following site in efforts to confuse the public by showing fictitious images associated with SOSBEE v fbi.com. The images of DHS have no relevance to my reports of unconscionable crimes by the fbi, except to show my legitimate **medical clearance. The 'nerdydata' group is also not properly showing legitimate images associated with www.sosbeevfbi.com. DHS, by allowing fbi to control administrative functions/records/associations, is a de facto operative for the fbi's counterintelligence operations and is therefore an instrument of oppression against the reporters of fbi/cia atrocities. Apparently the same Texas State Bar Official (TSBO) who improperly prevented the publication of my **ad for the November, 2015 Bar Journal, again reviews my material online as shown in the site meter image below. On the visit the tyrant studies the medical clearance data which contradict the fbi vicious libel campaign against me; thus, the TSBO may be in possession of the fbi smear campaign which the TSBO may have used as an illegitimate reason to block my lawful ad. "FOR THE DEFENSE in cases prosecuted by FBI: Geral Sosbee, witness to macabre culture and unlawful practice of the FBI. https://ttu.academia.edu/geralsosbee gsosbee@gmail.com"
Note that the Texas State Bar is far exceeding its legitimate function by allowing the fbi in any manner to prevent me from reaching other attorneys and the general public via the Texas State Bar Journal with regards to massive fbi murderous corruption and unconscionable crimes against my person. For details see "My Story In Detail" and related links & sites on line. In summary, the TSBO who is busy trying to justify the violation of the First Amendment to the US Constitution by the TSBO also serves the interest of the very torturers and assassins in the fbi who are the focus of most of my research and writing, and who continue to torture and try to discreetly kill me as I type this update. The police state is thus forced on the people by such bureaucrats who assist the fbi in their wholesale crime spree against me and others at will and with total impunity. The nation is kept in the dark by cowards hiding behind keyboards in positions of power. This report is intended to show evidence of the fbi’s unlawful interference with state and federal agencies (inter alia) and their employees in efforts to prevent me from enjoying all the rights and privileges to which I am entitled by law as a citizen and as an attorney, teacher, researcher and *publisher. So, one must ask why the Texas State Bar would repeatedly act so unprofessionally, improperly and probably unlawfully against this attorney as I have documented. The Texas State Bar is aware that I am a licensed attorney in good standing, that I have never received any adverse action on my license, that I have never been accused of any offense (civil or criminal) in my life that I am aware of, and that my credentials as a former fbi Special Agent (intelligence section for national security) and as an adjunct professional instructor of law at several colleges and universities is well established. As of this date no response is provided to me from the State Bar of Texas regarding their blocking of my proposed November, 2015 ad referenced above. Inasmuch as the Texas State Bar is a part of the state judiciary (i.e., the Supreme Court of Texas) I am not generally allowed access to their records as to why the ad was rejected and who made the decision to block the ad. and parts 19a, 19b, 19c. For more data see “My Story In Detail” and related links online. PS: fbi operative at Department of State sends me the harassing message shown below on behalf of his friends/assassins at fbi. Note that the US Department of State is run by cowards who by negligence or malfeasance allowed the torture and murder of the USA Ambassador in Benghazi. The fbi/cia/state department (DS) all pretend that the attack was no big deal. Even Hillary states regarding the Benghazi attack, "it doesn't make any difference?'' So, these are the people (fbi,cia,DS) who allow the fbi/cia to engage in all kinds of crimes globally and who also harass me as I have documented. “Geral Sosbee, witness to the macabre culture and unlawful practice of the FBI. Your classified ad was not published in the Texas Bar Journal. We will be sending you a full refund this week. Note that after I placed the ad the fbi punished me by DEW attacks and by remote manipulation of my car features and TV. I consider this action by the State Bar as a gross violation of free speech by a government entity; I also view the person who deleted my ad as a cowardly supporter of the assassins and torturers of the fbi.